Germany is famous for its trade shows. Every year nearly 700 different events take place all over the country. Some of those are huge international shows, such as CeBit, IAA, ITB or Hannover Messe; others are more local and more specialised trade events. Germany offers something for everyone; all major industry sectors are covered – manufacturing, technology, food, cars, beauty and fashion, leisure, travel, construction, education and many more. Every sector has at least a couple of trade events, each of them attracting different crowds. Choice of the show (or shows) depends on the nature of your business, but it is extremely likely that – as a foreign company – you would decide for an international trade show. These are usually taking place in one of the major cities, such as Frankfurt, Hanover, or Munich. For your convenience and reference we have made a map – cities hosting most international trade shows are marked dark red with their names in capitals; other cities are home to smaller numbers of shows, but they are still important, especially in certain industry sectors. 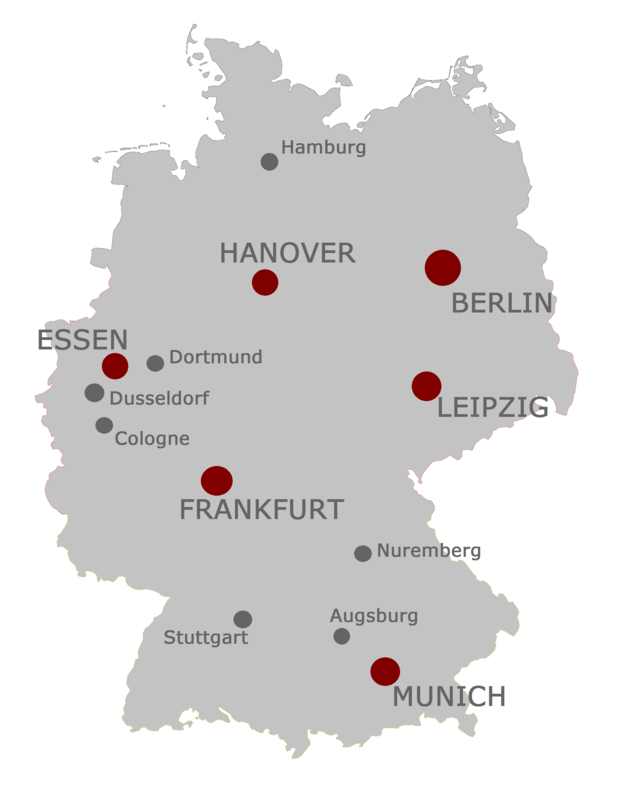 Of course, there are other towns and cities that host a couple, usually specialised trade shows – these are not on the map, but you might find them in German trade show list. One thing has to be mentioned before you decide for a particular show. As you can see on our map, there are 6 cities hosting the bulk of international trade shows – there is no clear leader in this group. This means that show organisers in these 6 cities, aside from trying to be the best in their own fields, are also in fierce competition. Visitor numbers count extremely much, and so does good publicity; no organiser would like to admit that visitor numbers have plummeted. As a result, trade shows change, and sometimes changes are very abrupt. The show that used to attract major players and professionals in the market might turn into very much end-user oriented fair-type event within 1-2 years, although official information on the show might not appear any different at all. Another example: a few of the biggest companies simply decide to cut their spending and refrain from participating in a certain trade show, although they have never missed one before. That means organisers of that show are suddenly faced with a big problem – lots of free space, less media attention, and less visitors. Of course, there are ways to solve or push the problem away. As a result, sometimes such unlucky show is merged with the other one (or other ones), sometimes empty space is wisely masked with other exhibits or seminar halls, etc. But there are times when nothing can be done anymore. During the last 10 years there were a couple cases in Germany when a formerly very successful trade show went bankrupt within 1-2 seasons due to loss of large clients. Sadly, this is just the law of supply and demand. Foreign companies, especially those coming to Germany for the first time, usually rely on media coverage of previous years of a certain trade show; this is used to make a decision whether to participate in that particular trade show or not. Our experience and examples above tell you: this might not be enough. Talk to us about your needs BEFORE you make a decision – it might be just the difference between failure and success.